Sticky and delicious, sushi rice is more versatile than you may think and is great in a stir fry, from BBC Good Food. Boil the sushi rice in a large pan with plenty of water – it should take about 8-10 mins – until it is just cooked and still has a bite to it. Drain, place back in the pan, cover with a lid and set aside. Mix the steak with the garlic, soy sauce, sugar and a grind of black pepper. You will need 2 frying pans or 1 frying pan and a wok: divide the oil between the 2 pans and heat until just smoking. Fry the eggs to your liking, then set aside. In the other pan, brown the beef for 1-2 mins, then remove and keep warm. Tip the vegetables into the pan, stir-fry for 1 min, then push to one side, add the rice and cook for 1 min more to heat through. 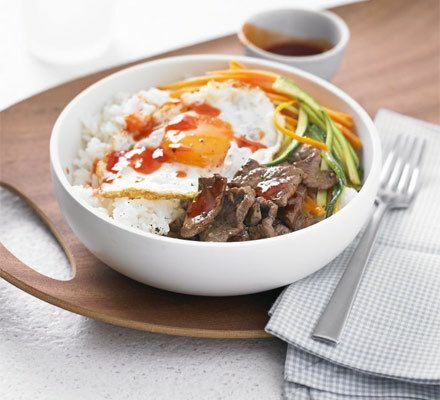 Divide the rice, veg and beef between 2 bowls. Slide the eggs on top and drizzle with the chilli sauce. Each person can then toss everything together, so the egg yolk mixes with the hot rice and sauce.